The RCMB42… series AC/DC residual current monitor the is used for residual current monitoring on AC charging stations for electric and plug-in hybrid vehicles in which DC or AC fault currents are likely to occur the value of which is constantly greater than zero. 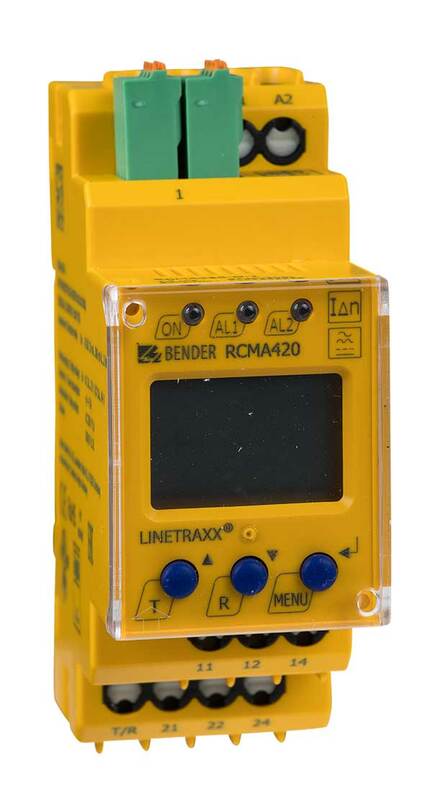 Alarm relays indicate if the limits of IΔn = DC ≥ 6 mA and/or IΔn = RMS ≥ 30 mA are exceeded. Both items of information are signalled by the same relay. After actuation of the test button on the front panel, the integrated microcontroller generates a test current that comprises an AC signal with superimposed DC component. The magnitude of the test current is designed such that the response value is exceeded and therefore alarm relays are triggered if the device is functioning correctly. The RCMB42… is available in two variants matched to the related application. The two-channel device RCMB420 is intended for usage in charging stations with several charging points, while the single-channel RCMB422 is essentially intended for usage in a wall box.